E-mail is far and away the easiest way to reach club contacts. Most of us have real lives that, sadly, interfere with our trigger time. E-mail allows us to get back to you as time permits (usually within a day, often less). info@lineadefuego.net for questions, more information, etc. scores@lineadefuego.net for questions about match scores. webmaster@lineadefuego.net for web site related issues. Please do not try and contact us from an email address that requires further action, e.g. an address that responds with a challenge email such as "Please go here to add yourself to my safe senders list." You will not get a reply. We have a low volume mailing list that we use to distribute score updates and general announcements. Learn more about the list and sign up here. You can also use the same link to remove your email from the list (but nobody ever does). We don't sell, share, or rent your address and your email address is not visible to other list members. You may need to white-list scores@lineadefuego.info so the mail doesn't end up in the trash (although our mail doesn't normally score very high with spam detectors). If you prefer you can get match updates and score posting notifications on Twitter. Follow us at @ldf or visit http://twitter.com/ldf. The club now has a very busy online forum (shared with Oceanside Practical Pistol) with lots of active members ready to offer tips, suggestions, or other helpful info. There are forum boards for general competitive shooting topics, for our own LDF matches, for other regional matches, for firearms training, news, reloading, general pistol discussions, general rifle discussions, as well as miscellaneous chatter. Posting in the forum is often the fastest way to get an answer to your question. The forums are also a great place to get to know other OPPC shooters. Many of our group shooting events are planned entirely within a forum thread. It only takes a minute to sign up and membership is free http://lineadefuego.net/forum/. 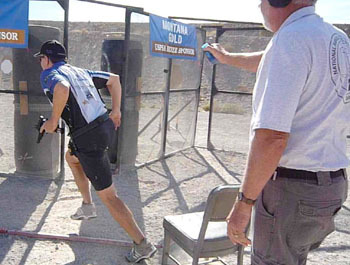 Matches are held at the North County Shootist Association range in North County San Diego on the Pala Indian Reservation (very near the Pala Casino). From interstate 15 take State Highway 76 east. Turn left at stop light for the Pala Casino and Resort onto Pala Mission Road. Proceed east on Pala Mission Road until you come to Henderson Road (just past the mission). Turn left on to Henderson Road (Henderson is an unpaved road). Follow this road about 1/2 mile until you arrive at a double swinging metal gate. Stay on the dirt road and drive through a gate past a sign that reads "SHOOTERS DOWN RANGE". Continue on the dirt road until you come to the parking area. Match sign ups take place under the canopy. If you're a GPS user the range is located at 33.372425 north, 117.066321 west.